April 4th was the Mechanicsburg, PA location’s Grand Opening Celebration. It was great to see lots of new customers that we anxiously awaiting to come to the store. An amazing thing to witness was the degree to which the customers varied in age, beading experience, and what they use beads and findings to produce. We had a great opportunity to speak with many of them about their beading past and their excitement about their beading future with the Potomac Bead Company. It dawned on me that although there was such a variety in people, every one gets equally excited about beads. It is always fun to interact with children, excited to string their very first stretchy bracelet, agonizing over which beads to choose but most adults in a bead store are just as excited as the eight year old standing next to them. 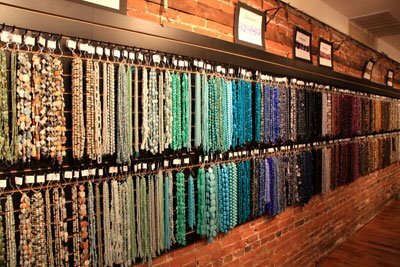 Bead stores really are more like toy stores for creative, crafty people of all ages. During the busy events of the day, I did manage to have time to sit down and demonstrate some wire working techniques that we offer to customers in the form of classes. Many people look at wire as too hard or difficult but I tried to convey that wire is the next logical step to basic stringing. There is so much that can be done with wire to enhance jewelry. More then any other class, I believe the Introduction to Wire Working is the stepping stone into a whole new world of jewelry making. After the class, I always suggest that people buy a package of 20G wire copper wire and play at home with their tools to see what wonderful things they can create. Often people are stunned by how easy wire working is once they have learned the basics. I also advanced from the basics of wire working and demonstrated cabochon wrapping using 20G square wire as well as 20G half round wire. Showing how to wrap cabs answers the inevitable question “what do I do if the stone or pendant does not have a hole.” Hopefully everyone enjoyed all the demonstrations on Saturday which varied from seed beading, to dichroic glass, to chain maille and so on. Mechanicsburg’s opening was a huge success and I am anxiously waiting for the Phoenixville location to open at the end of this month. I have to agree that for anyone who enjoys beading, wire working is a must-learn. After picking up the basics, I found that I could then make much more intricate and interesting jewelry. A simple chain link can add an elegance and delicacy to any beading project and with a little patience, jump rings can be used to create beautiful bracelets — with or without beads. 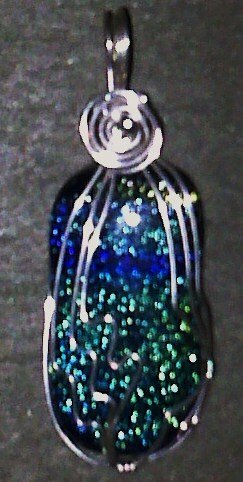 I would encourage anyone who enjoys working with beads to give wire working a try. You’ll love the results!